An important new contribution to the theory and practice of Transgenderism has been released on Twitter, marking the end of a momentous year. 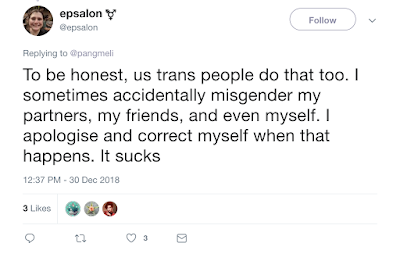 The author, known as Fangmeli, has given lengthy consideration to the failings of cis allies like herself. From this analysis, she has developed recommendations for corrective action. The full text of her series of tweets is published below, for the edification of readers. 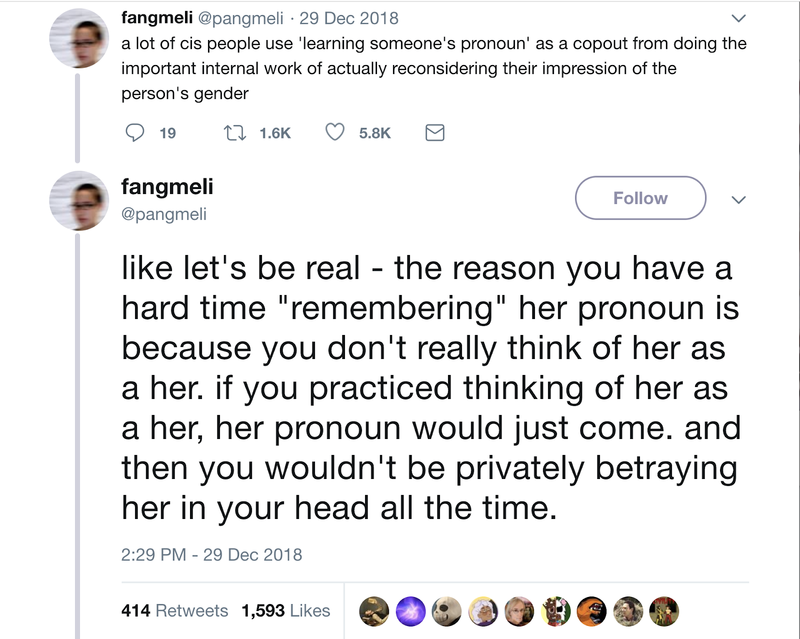 2. like let's be real - the reason you have a hard time "remembering" her pronoun is because you don't really think of her as a her. if you practiced thinking of her as a her, her pronoun would just come. and then you wouldn't be privately betraying her in your head all the time. 3. actively switching out a filter we've applied to someone is something we (cis people) already do all the time — like when we learn someone we thought was 20 is actually 32. when that happens, we take time to actively contemplate and re-conceive of the person as a 32yo instead. 4.we already switch out gender filters, too. for example, when a parent asserts their baby's gender, we're ready to quickly apply that gender filter (i.e., gender-related assumptions, interpretations & schemas) by actively 're-rendering' the baby as a girl or boy in our head. "as well as actually thinking about their own gender or gender as a construct and interrogating gender performance, roles, and our collective attachment to the binary"
"For me it's more of a case of habit. When it's people I haven't met and I'm corrected, I change easily, but when it's someone I've known for a long time, changing that habit gets to be a lot more difficult." "And that’s ok, it can be hard to switch how we envision a person when we have thought about them for a while in a specific lens. 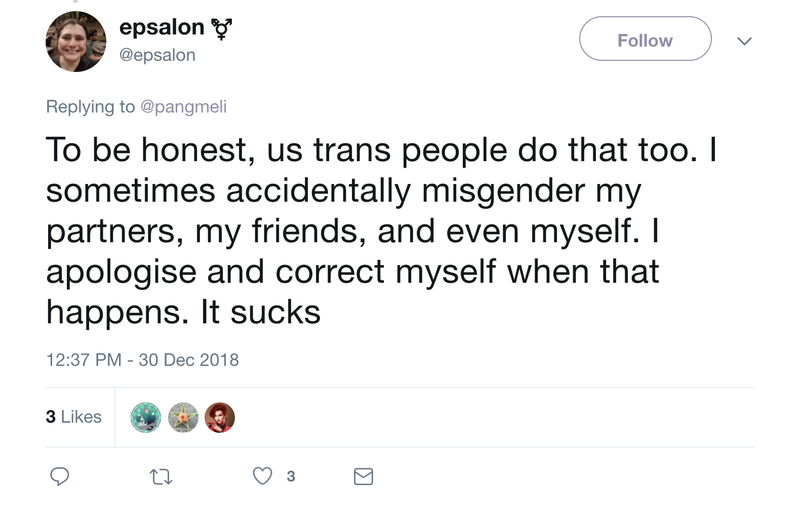 With the caveat that it ain’t an excuse if we misgender that person"
"I never act as if it's an excuse. I always apologize and try to be better in the future." "I'm going through this for the first time. 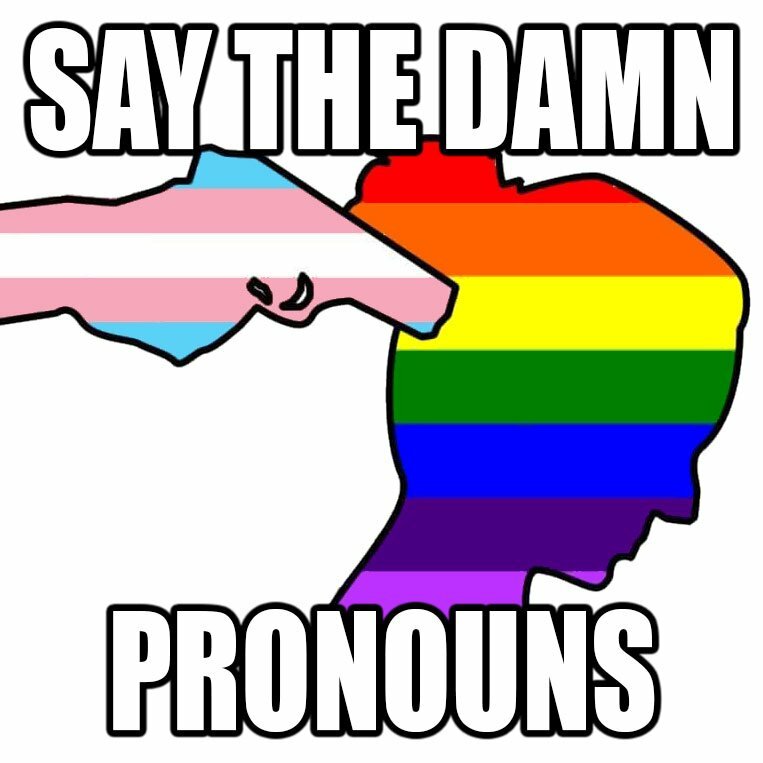 Every trans person I met before was already out when I met them. Now my friend came out, and its making me think about how I was able to put those other folk in their preferred mental category immediately." "Some of it is just your brain caching things. When I moved from Canada to the US and started pronouncing the letter Z how Americans do, I had to re-learn not just how to say Z, but Z in my name, Z in ZFS, Z in zlib, etc. Same with gender. It just takes practice." "This plus the work of questioning 3rd parties when it takes interrupting the conversation to do so. It's a pain in the arse but people have to get on with just doing it." "people do it for dogs and cats all the time but when it's a human being asserting their own identity it's just too much effort"
"How many fingers, Winston? ";"This is the kind of ridiculous word salad that gets a mute from anyone with a functional brain. ";"Everyone is important but that doesn't mean that every claim they make is true. People who refuse to validate the delusion that people can change sexes are not committing thought crimes. Anyone who believes they are has been failed by their mental faculties. 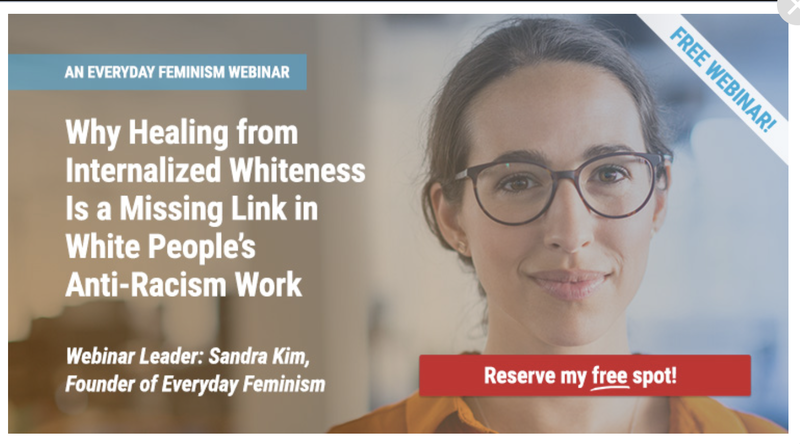 "; "Why on earth would I waste one second of time thinking about how to delude myself into cooperating with someone who is delusional and hates women? "; "Oh. You showed me. What was I thinking. I've been so wrong, and just needed the right comment to bring me round. Thank you so much for your pithy, thought-provoking take and all the unique arguments it presents. I've never heard anything like this before". Clearly, much more work needs to be done. What does this mean? Self-identified 'mom, author, TV & Radio Host' Laura Ingraham sent a tweet on 15th June 2017 that said, 'MSNBC going out of its way to not mention that [James T.] Hodgkinson was a rabid Bernie Sanders supporter.' 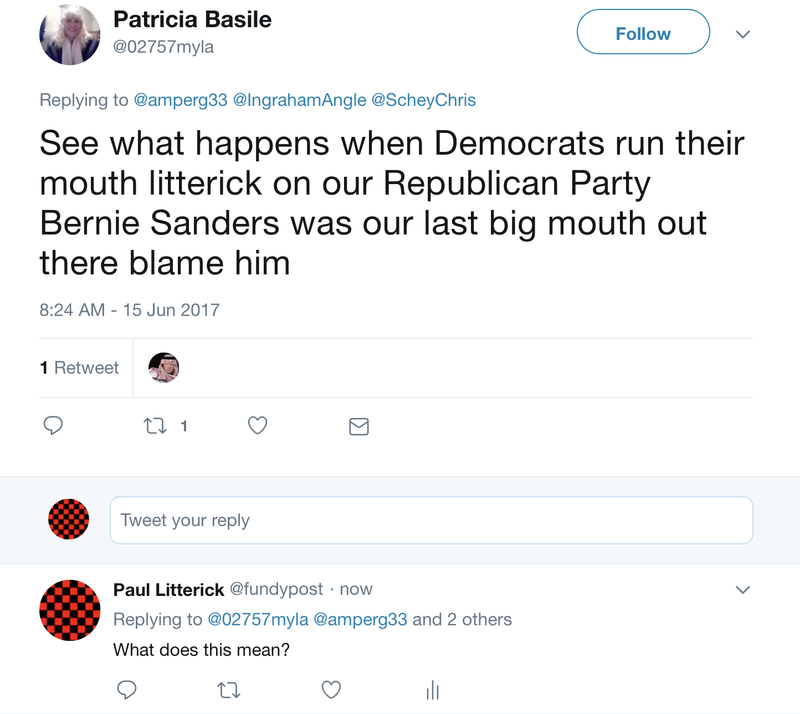 She was referring to James T. Hodgkinson, the leftish activist who shot at Congressmen practising baseball on the previous day. 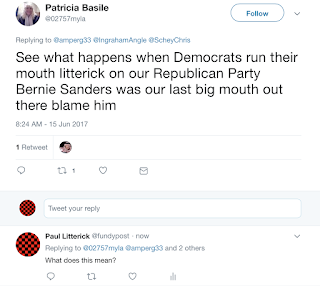 One Patricia Basile (of West Palm Beach, Florida) retweeted this tweet with the remark, 'See what happens when Democrats run their mouth litterick on our Republican Party Bernie Sanders was our last big mouth out there blame him.' This comment made perfect sense to one Chris Schey, who retweeted it to his followers. Nobody questioned the meaning of Ms Basile's remark. Until now. Twenty-four hours ago, I sent a tweet to Ms Basile, asking the question that needs to be asked: "What does this mean?" I would like to know why my name was dragged into this controversy. I am not a supporter of the Republicans or the Democrats. I refuse to blame Bernie Sanders or anyone else.